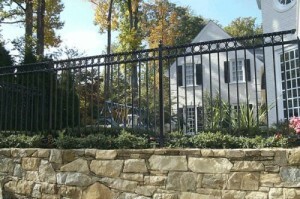 What are the benefits of an Ornamental Steel Fence in Richmond? If you’ve been looking into installing a new fence in your Richmond yard, you may have come across many different types of fencing, but how do you know which kind to choose? Take a look at ornamental steel fencing! From aesthetic to functionality, it could be the perfect fencing choice for your Richmond property. Decorative. An ornamental steel fence is made so that the metal is heated, enabling the spires, or posts to be bent and shaped. These fences look great against gardens, greenery, and even pools. You can choose which decorative spires look best with your home and yard! Protective. Any fence provides protection, but an ornamental steel fence can actually provide more than let’s say, a wooden fence. Because the spires are bent and shaped, they can be especially sharp and pointy, making it difficult for any possible trespassers to climb over and enter your property. Steel is also a very strong material – up to 4 times stronger than aluminum! So you don’t have to worry about your fence being knocked down. Low-maintenance. You don’t need to worry about repainting the fence every year with steel fencing. In fact, an ornamental steel fence hardly needs any maintenance at all! Are you convinced yet? To find out more about the benefits of an ornamental steel fence, call a professional at Hercules Fence Richmond! At Hercules Fence Richmond, we specialize in the installation and maintenance of fences throughout the Maryland, Virginia, and North Carolina areas. If ornamental steel fencing isn’t for you, we’ll work with you to help you make the best decision for the privacy of your yard. To get started, call us today at 1-800-883-3623. You can also visit our contact page to find a full list of our locations and phone numbers. This entry was posted on Wednesday, October 8th, 2014 at 2:24 pm. Both comments and pings are currently closed.